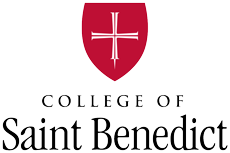 Judy Gretsch Schmid ’63 knows introducing new students to the College of Saint Benedict has the potential to change their futures. So, when she learned that a building renovation project would include space that welcomes our students, she wanted to get involved. “I consider it a privilege to give to this area at Saint Ben’s, as they have nurtured so many women to be caring, contributing citizens of our global communities,” she explained. Schmid pledged to name the plaza of the Guy and Barbara Schoenecker Commons project, which has become the inviting new front door of campus to the 4,000 prospective students and their families who tour the CSB campus each year. Each of these tours pass through the plaza, providing an ideal space for visitors to experience the warmth and beauty of Benedictine hospitality. The full Schoenecker Commons space houses CSB Institutional Advancement, the CSB Business Office, CSB/SJU Human Resources and the CSB/SJU Office of Marketing & Communication. In addition, the renovation freed up space to transform the Main Building into a true 21st century learning space.